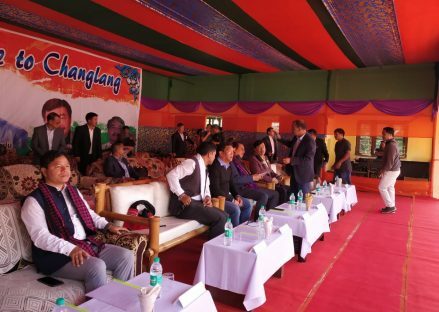 CHANGLANG, Dec 6: The ‘Arunachal Rising’ campaign led by Chief Minister Pema Khandu along with Deputy Chief Minister Chowna Main and BJP Pradesh President Tapir Gao reached Changlang district on Wednesday, December 5, 2018. Disclosing that the state faces a shortage of about 70 circle officers, Pema said the posts would be filled through recruitment by the APPSC, and through lateral entry. He also responded to a public memorandum and promised to address it. The CM gave away cash prizes and certificates to the winners of essay and painting competitions for school children conducted as part of the campaign. He also gave away cash prizes and certificates to best ASHAs, anganwadi workers and progressive farmers. Earlier, the chief minister visited the Rangshom Him (prayer house) here and offered prayers to Rangfrah. Interacting with the Rangfrah believers, Pema assured to develop a link road to the prayer house, and to provide an ambulance. The chief minister also inaugurated the new District Secretariat building; the project for augmenting the water supply to Changlang township under RIDF (1.5 mld); and the 4.14 km cement concrete pavement road in the township and the 36 km double-lane Changlang-Margherita road under CRF, both executed by the PWD. 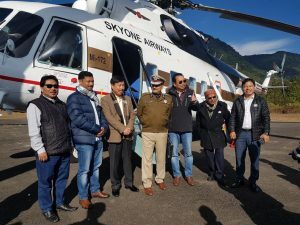 On December 7, 2018, CM Pema along with DCM, BJP President, Chief Secretary, DG of Police, DC Changlang and others depart for Vijaynagar to expand the ‘Arunachal Rising’ Campaign further.